Scroll down for some additional insights from Randy Buchanan on "Slippage" and "Breaking Strength" in drivetrain components. Rocnroll told us why it normally can't: "There's a little poppit ball in the shift mechanism that keeps it from going into low range in two wheel drive. At rebuild time it can be left out, allowing 2WD low range." 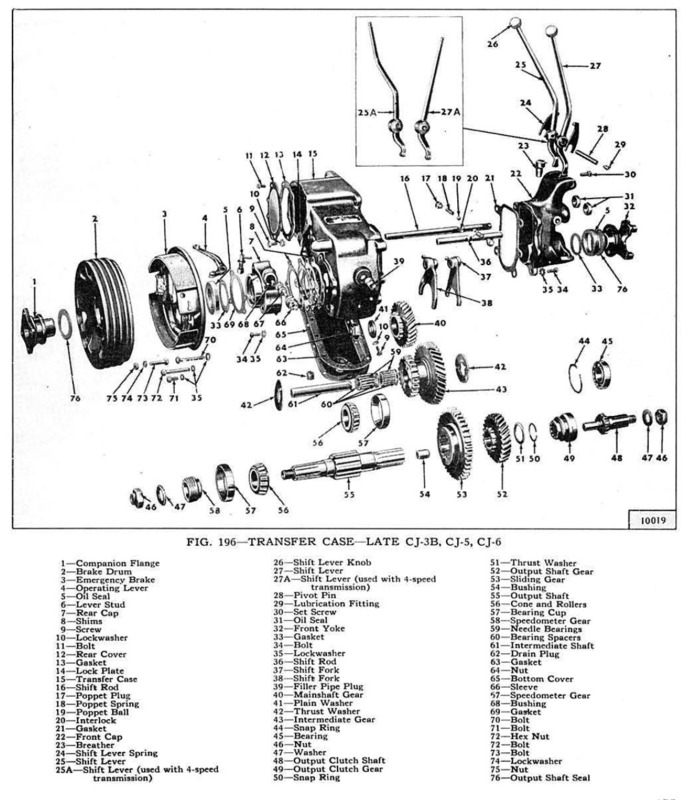 (See an exploded view of the Spicer 18 Transfer Case, 200K JPEG). But Ed Wilson warned: "There's a reason for the 2WD/low range lockout. You can break an axle in a heartbeat with all the torque going to one axle. With open differentials, the thing is really a one wheel drive or two wheel drive depending, as only one front and one rear axle get the power, even in 4WD.Just drop one front wheel in a hole deep enough to lift one rear wheel off the ground, you'll see what I mean. Be careful if you make this mod." Jyotin had a far easier method: "I always prefer the easy and cheap method -- lockout hubs. They will do the same thing, plus with the front axles turning you'll splash some of that 140-weight oil up on the top spindle bearing. The spindle bearing will like it too! That was the method I used in my old F-150 when I was using it around the place. I needed the low range a lot, but I didn't need 4WD much at all. Tom: "I'm just looking for the safest way (mechanicaly speaking) to drive relatively flat but very bumpy trails slowly. If you leave the front hubs open isn't all that torque still going to just the rear shaft, or by simply having it in 4x4 does it divide the torque in half? That sure seems counterintuitive. Seems that if one driveline has no resistance, all the torque would go to the other driveline." Jyotin: "Opinions abound, but I'd be interested in seeing the mathematics of this. At any rate, it seems to me that any trail that does not require 4WD would not be one in which you would exceed the shear rating on the axle. There is too much margin built into these old critters." Rusty had another reason to remove the poppet ball: "It lets you go to 2WD low to make a tight turn, then back to 4WD. Just be gentle on the throttle." Gavin Ferguson: "There is absolutely nothing wrong with running a vehicle in 2 Lo. You will not put more stress on any components, whether diffs are open or not. I have installed numerous 2WD Lo kits on newer 231 transfer cases, and they are awesome. On the 231, you need to take the case apart and replace a few parts with the new ones that have extra notches. You get good gear reduction control, and drivability, which is key when on rock like Moab or Sedona." Randy Buchanan: "Many Jeeps have D300 transfer cases, which when equipped with a common 'twin stick' conversion, can do either Front or Rear 2-wheel-drive independently, or 4WD hi or low. This gear box functions differently than a D18, in that it has an independent hi/low range gearset for each output shaft. The only thing you can't do is have the front in hi and the rear in low, or vice versa, as the gearbox doesn't respond well to this situation. Usually a Jeep with this conversion is going to have lockers in both axles anyway, so the worst case is division of torque by 2, which can be driven relatively safely, but still it is usually used only in tight situations and briefly. One thing they do is engage front wheel drive, put rear in neutral, set parking brake (or cutting brake). This allows the Jeep to be pivoted around the inside rear wheel. I've seen a perfect 94" radius donut. The capability comes in handy once in a while." Bob Rowe described the Dana 300 twin-stick transfer case in more detail on the old Jeep-L list: "The inboard shifter selects rear axle aperation, and the outboard shifter selects front axle operation. Both shifter levers operate the same -- forward is low range, middle position is neutral, and rear position is high range. For regular 2WD, the inboard lever is pulled to the rear, and the outboard lever is put in the middle position. To go to 4WD high, both shifters are pulled to the rear. To go to full neutral, both shifters are placed in the mid position. To go to 4WD low range, both shifters are pushed forward. "With the Dana 300 twin stick set up, 2 additional modes of operation are possible. You can have 2WD low range by pushing the inboard stick forward and leaving the outboard lever in the middle position. This is a neat off-road position if you have an auto locker in the front. Stay in 2WD low range, which should handle most terrain, but steering will be easier because the front axle is disengaged. When extra traction is needed, just slip the outboard lever forward to add front axle engagement. "The second neat position is front wheel drive low range. This is with the inboard stick in the middle position, and the ouboard stick in the forward position. this is handy if you don't want the rear shaft to turn for some reason. If your emergency brakes work, and you have a front locker, there is a fun maneuver you can try. Do this only on very low-traction surfaces, like sand or deep snow. Put it in front wheel drive low range. This disengages the rear axle. Then set the emergency braks. Turn the steering wheel one way to full lock. Blip the throttle. The Jeep will practically pivot around the inside rear tire. You can really get around sharp turn that way. But don't try this on any surface that has any decent traction, or you will break some serious parts! "BTW, unless you modify the t-case, you can't get front-wheel-drive high range. There are some detents in the transfer case that prevent one axle from being in high range and the other axle being in low range. The same detents prevent you from getting it into front wheel drive high range. Probably a good thing -- people might then try to drive it a high speed with only the front axle -- not a good idea, esp. with a front locker." Randy Buchanan provides some math and some background on the Spicer Model 18 modification: "I've seen this mod many times; the only problems that I've seen arise are on early Jeeps where the rear D44 has 2 piece axles. They will twist off (usually by shearing the key) especially if you have a T98 with a granny low. Even with an F-head for power. "Divide that by 4, 2, or 1, and you see exactly what the drive axle on each side has to contend with. Now how about 400 ft lbs from a small block V8; 35,000 ft lbs! This is why you see all of those custom Dana 60's on rock crawlers. The absolute best axles made right now for a D44 can take about 9000 ft lbs. Early 2-piece axles are good for about 2500, if they are in good shape. (Note: If each drive axle is good for 2500, that would be a total of 5000 for the rear if both sides were locked together.) See a cutaway illustration of the D44 (100K JPEG). "It's easy to see that if you're going to use 2-wheel low, you better keep your foot off the throttle, which is exactly the way guys have been using this conversion for 30 years. Jyotin: "I'd think that the front model 27A axle would be the limiting factor in the T-98/model 18/5.3 diff setup. It would seem that the front axle should be able to handle at least 4250 foot pounds. Naturally Jeep would not have designed the setup right at failure level; most times there is around a 50% margin, so one would expect the model 27A to be able to handle ~6400 foot pounds, with the rear dana 44 having a higher capability because of its size. "If a T-90 was used instead, the unit would generate about 4400 foot pounds. If we accept the ~6400 foot pounds that the model 27A would have to be able to handle, with the larger dana 44 being able to handle even more, then the 2WD low range would be an acceptable, low risk modification. "With the T-98 installed you'd be pushing the envelope to the max that the designers designed, but still within their margin of safety however they designed it. It must have been of some concern to Jeep, because when they put the T-18 behind the V-6 (using the same Dana 44/27A axles), they reduced the granny low range to 4.01." Paul: "One thing that should not be forgotten is that when a locked axle/diff. has one wheel off the ground all of the torque is going to only one axle shaft (the one with the wheel on the ground), not two!" Model 27 axles are renown for being weak. Even Mod 25's are stronger. (Yes, the ring gear on a 25 is bigger than a 27.) I doubt if the "microscopic" universal joint crosses in the drive axles are even good for 1,000 ft lbs. The original design had plenty of margin built in because of slippage, not because of heavy duty parts. You ask any "old time Jeeper" and they will all tell you about breaking axles by dropping a wheel in a hole, when trying to climb a hill, with the power on. Probably one of the most common failures on Jeeps, period. Mod 27 axles have two weak points; the U-joints and the junction of the knuckle and spindle. (Studs holding them together get loose and get torn out of the knuckles, usually when a wheel drops in a hole.) A Model 30 axle is a 27 with open knuckles, thus eliminating one of the weak points. Now there are aftermarket axles available for D30 which take care of that, moving the weak link to the hubs, which are cheaper and easier to change than an axle. A 2 piece D44 "Individual Drive Axle" (each side, not the whole axle assembly) is probably not even good for 2500 ft lbs. I was being generous; the keyed 2-piece design is the problem, that's why they changed to a solid 1-piece design (also they are cheaper to produce). When the key starts to get loose it allows the flange to rotate slightly and "build momentum" during "high torque" situations, like rapid acceleration or deceleration. If it is in good condition, i.e. the nut is tight and the key is not worn, the axle usually breaks just outside of the splines. If the nut's loose it will shear the key. For normal operation they are fine. The safety factor is in the fact that with an open diff the individual drive axles can only reach ultimate breaking load under very specific circumstances. Those circumstances are generally a situation where one wheel is off the ground, and spinning, and then dropped to the ground, causing an instant torque spike, and failure. This is a common driving error. This same scenario will break 1 piece axles just as easily. Remember in the late '40s there were no lockers or limited slips, and with only 60 HP this was an acceptable risk, with plenty of margin built in. 2-wheel low was not a factor as it was prevented by the transfer case, for this exact reason. These vehicles were designed for the stock drive train parts to give "acceptable service" when used "normally". Aftermarket parts such as lockers, limited slips, bigger wheels and tires, all up the ante, and progressively stress parts all the way up the drive train. Also they are not allowed for in the original design. The idea of 33x12.50 Mud Terrains never crossed their mind; 6.00x16 did. When these vehicles were designed, the words "tough trail" referred to a dirt road that hadn't been graded in the last year. Even the "Rubicon Trail" was a decent dirt road at that time. They deliberately haven't graded it for 50 or 60 years for obvious reasons. The Rubicon has changed, as have most of the trails we drive on for "recreation". Our lives don't always depend on our vehicles, like in a war, or living 50 miles from the nearest town. The fact that we now try to do things that our predecessors would not have dreamed of, is how we have fun. Probably a luxury they couldn't afford. I am pretty sure the T98 was only available in Jeep "Universals" as a dealer installed option (mine was installed as a kit) like extra seats, heaters, freewheeling hubs, powerlocs, etc. So "Caveat Emptor" would have been the order of the day, as the warranty probably didn't apply to those items. When talking about Jeep engineers we must take into consideration that they were looking at the problems they had to solve from a 1930's / Depression / Wartime viewpoint, and they used what they had to work with. Not from our viewpoints of computers with "Solid Works", CNC machining centers, and 75 years of engineering evolution. Finite Element Analysis didn't exist then. They didn't have the time, the money, or the ability to design the way we do nowadays. I doubt very seriously if Dana/Spicer Engineers had any way to check how much torque it took to break an axle (although a "picture" of a large vise and a torque wrench with 25 feet of pipe on it comes to mind.). Most of what we do today, design-wise, didn't exist then. Sure they did some calculations, (with slide rules) but a lot of their "calculations" were "that looks good enough, by gosh and by golly", and then beef up whatever breaks in the tests. The prototype Jeep was built in about 50 days from parts that already existed (4-wheel-drive was not new.) The transfer case and the front axles already existed. They had to have existed as they couldn't even have produced the patterns for the molds for the cases in 50 days. Luck was also an issue. Really, do you realize that between the MB and the late CJ-5 the drivetrains have very few differences (maybe 5) and I am pretty sure they were corrected based on real world failures over 20 years and not "calculations". Even today, real world failures and owner complaints drive upgrades and recalls, along with the competition. Perfect example of this is the brake system on my '95 Dodge dually. With the rated load on the truck the system is "marginal" (that means less than 10% safety margin) at best (and I'm sure they knew this); as the brakes wear (2 rebuilds in 40,000 miles) it becomes downright dangerous. Without the "Jake Brake" I had installed, I'd be dead 50 times already.... But most people are not going to load the truck to the max, and if the brakes are worn that's your fault, not Dodge's, so its an acceptable risk (for them). The new Dodges however, have huge 6-piston calipers in the front and disc brakes on the rear and a hydraulic assist instead of the vacuum booster. It's called "Product Development by Risk Management" and the idea is not new. Now let's speculate; was the upgrade on the brakes done for safety reasons, or just to keep up with Ford and GM...? Let me guess. I went to my longtime friends at Coast Driveline in Ventura CA to gather more data on the subject of the strength of drivetrain components. Owner Bill Paul and head guru Mark Chuhaloff have been doing drivelines and axles since 1975 and are really savvy when it comes to designing and building them. As an aside, Bill Paul was one of the local "car guys" when I was growing up, and bought the shop he worked in after high school. It is now known to all gear heads in the Ventura County area as one of the best places to get what you want done, done right. Upon consulting the Dana/Spicer books at the shop, we found some interesting things out about how U-joints are rated, as far as "Service Life" and "Breaking Strength". U-joints are rated for applications based on the amount of torque they will be subjected to over a period of hours. Example: a "1310" series U-joint which is the common 1/2 ton U-joint used on just about everything known to man, is rated at 130 ft lbs for 5,000 hours. That means that if you were to load this part to 130 ft lbs, and keep it constantly loaded, it should last for 5,000 hrs. To put this in perspective, if you consider a vehicle traveling at 50 MPH it would take 2,000 hrs to go 100,000 miles, Or 5,000 hours would be 250,000 miles. Not a bad service life. The "utimate failure" torque for that part is 1600 ft lbs "when new"; it decreases with time. What that means is if you lock one side of the U-joint and induce an "immediate" amount of rotation or a "torque spike" of 1600 ft lbs it will fail. 1210 series U-joints like the ones used in D27 front axles, are good for 1250 ft lbs, ultimate. This kind of situation can only be achieved under extraordinary circumstances, but it is possible, and with bigger tires and more horsepower it's even more likely. "Slippage factor" is the safety valve designed into a drive train. Slippage factor is all about the fact that no tire is ever in "mechanical engagement" with the ground unless it is wedged in a hole, or some abnormal situation. It is held in contact by gravity. When torque exceeds traction, then slippage occurs, and the torque buildup is released. This would seem to indicate that lbs/sq in. would be the defining factor. And in a flat ground situation it probably is. Traction is the opposite of slippage. We can equate the size of the contact patch when the tire is resting on the ground, to the amount of traction it can develop. 6.00x16 tires have about a 6x6 contact area or 36 sq in. The Swampers on my CJ-5 are 35x15.50x15 at 2 PSI; where I run them off road, the contact patch is 18 x 22 or 396 sq in. That's 11 times the traction that a stock size tire has! That means it will take 11 times the torque to slip those tires, that it takes to slip stock tires. Needless to say, it's hard for the Mercruiser motor to to slip these tires even in bottom gear which is 93:1. I have 3/4-ton axles so I'm safe. The biggest strain on stock drivetrain parts is the addition of bigger tires, as this dramatically reduces the slippage factor built into the drivetrain. To figure this out for yourself compare the contact patch size from stock tires on your Jeep to the size of the contact patch on the bigger tires you want to run. This will tell you the percentage of the safety factor you have eaten up with the bigger tires; you should redefine your driving style accordingly. Note: As a sidebar, Bob Remler mentions the CJ-10, sold in the U.S. only in a short-wheelbase version as an aircraft tug (90K JPEG): "These Jeeps were built in extremely low quantity, for use as remote site aircraft tugs. Where the bed would have been was an enormous hitch, listing various aircraft models and weights. They had diesel engines. The unit was in permanent low range, and permanent 2WD for this service." CJ-10 photo taken by Derek at the 2002 Jeep Employees Car Show (80K JPEG) in Toledo. Chassis illustration from a Willys Farm Jeep brochure, Form No. KW1706. Cutaway illustration from a Mitsubishi CJ3B-J3 Brochure. U-joint illustration is an Omix-Ada replacement for a Model 25 axle shaft. Elsewhere on the web, see Jeep Axle Specs and How to Identify Jeep Axles.